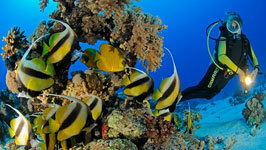 If you have a question about a particular tour in Sharm don't hesitate to ask. Otherwise you may find the answer your looking for from the previous customer questions below. Me and a friend are interested in taking your Coloured Canyon one day trip. It is unfortunately not possible to book a date for this trip on your website. Are you still offering this excursion? We would like to go one day in April if it is possible. 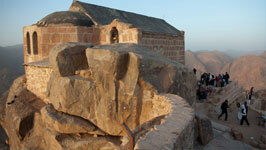 Me and and a friend are interested in going on the Mount Sinai tour in April. We would like to ask if there is any possibility to arrange a pickup outside of Sharm El Sheikh? Me and a friend are planning to travel from Suez earlier in the day to arrive in Sharm El Sheikh for the Mount Sinai pickup time at 9pm. Is there an option that you could pick us up anywhere further west from Sharm El Sheikh or even from Suez? can I please have a mobile number I can whatsapp call, I would like to book 3 tours. Is the Jerusalem tour running on October this year? This trip is stopped and we do not know when will be running again ! What hotel do you stay in Cairo and how are meals organized! we are working with 4 stars hotels in Cairo looks like Grand Pyramids hotel on B-B Basis ( includes breakfast ) . in all our trips to Cairo we visit the pyramids . Hello , You can pay your deposit by credit card online . - What time will each event be at local time? - Is food included in the trips? 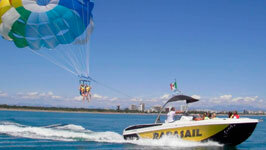 - When we add excursions into the basket we do not get the offer "Buy 3 & get 1 free" as advertised. How come? Hi , When you add the fourth trip you find it for free because till now you said only 3 trips . in the Cairo and Luxor trip lunch for 2 days and breakfast for one day included , for the Bedouin trip dinner is included but there is no meals in the Swimming with Dolphins trip . I have a Sri lank passport living in London, I have my Egypt visa for visiting Cairo. Iaftwr Cairo Im going to Sharm El Sheikh, do I need a separate visa for Sharm? Hi. I like to ask if there you need visa for going to Cairo? yes to go to Cairo you must have the Egyptian Visa ! Hi, I am booking a trip to Egypt for my husbands birthday as a surprise. I would like to know what special requests you have a o offer? 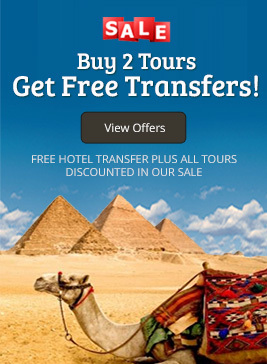 I was wondering if it was possible to book a trip to Cairo through your company? With pleasure to offer you a nice cake during your Cairo by air trip so this trip one of the best trips to celebrate this special occasion . Will be available by boat / road from 01st March 2018 . Marriott Sharm hotel and also Noria Resort and Sonesta hotel . Are flights included in the http://www.sharmexcursions.com/cairo-by-plane-excursion ? 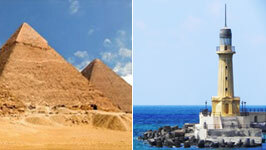 The trip to Cairo by plane from Sharm includes the return fly tickets Sharm - Cairo - Sharm . 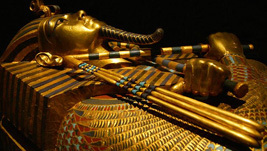 Hi I want to book Cairo excursion for 2 adults on 21st December. I would like to know if it would be safe to travel to Cairo from Sharm El Seikh and do you have any availability? This is very safe to travel to Cairo and all the trips to Cairo are running every day ! I understand that I only have to pay 10% at the time of the booking. Can you please let me know in which currency I have to pay the rest of the price in cash? You will pay the balance for your trips in Egypt when you meet our rep. at your hotel before your trips , you will pay In Cash but you can pay in Sterling Pound Or in US $ or in Euro or in Egyptian pound as you prefer. Hello. 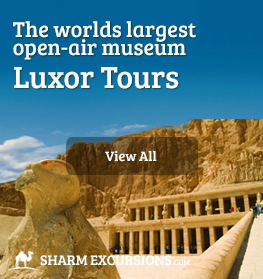 I would like to book the Luxor tour October 11 (1 adult). But I cannot pick the date (or any date) in the calendar. Is the tour cancelled ? I have no problem choosing dates on other tours. Because Luxor trip by plane from Sharm is stopped at the moment . We offer Ras Mohamed by bus half day trip and we offer also Ras Mohamed by boat full day trip ! Do you pick up at the cruise port terminal? If not what is the closest point of pick up and how do we get there? Also, if two book do both have to be able to drive? We will pick you up at the main gate outside Sharm Port ! Hi We will be arriving in Sharm el Sheikh from Saudi Arabia. We are indian nationals. We donot plan to go to any other area of Egypt . We have a stay of 7 nights in Sharm and return back to Saudi . Is a Visa reqired? Because you will stay all your holiday in Sharm and will arrange only local tours inside Sinai only so you do not need to get the visa ! Hi id like to ask if i book something...Then u guys going to pick me up?Thanks for ure answer. For all your trips which you will book with our company we will pick you up from your hotel to go on the trip and after the trip will transfer you back to your hotel . Am planning a trip to Egypt. a) Is it safe to travel on road from Cairo to Saint Catherine? b) Also it is safe to spend a night or two at Sharm el Sheik? c) Can I can from Cairo to Sharm el Sheik? Kindly we would like to inform you that : This is very safe to Stay few nights in Sharm , also very safe to go by road from Cairo to Saint Catherine . If your holiday will be in Cairo this will be okay to go by flight from Ciro to Sharm . i want to book this excursion with my wife. we will be sharing a room and there fore there is no need to have 2 rooms booked in cairo. i want to know how the price will be adjusted based on the use of only 1 room. The price into our website based on 2 persons in one room not 2 singles rooms . i am interested in taking this trip with my wife. we would be sharing a single room for the over night in cairo. how would that change the price since we would only need to pay for 1 room instead of 2? also are any meals included? For Sure this trip will be available for you but we recommend to have a private trip to be easy for you to stay longer time or shorter time at each place . in this trip Hotel in Cairo is included with breakfast of the second day and also lunch on the 2 days . This is very easy to get the Egyptian visa upon your arrival at Sharm airport , it takes only few minutes to get the visa which allow for you to go to any place in all Egypt . Hello. Prices on the site are in Egyptian pound? Thank you. All prices for all our Excursions into our website in Sterling Pound . But you can pay for your trips in Egyptian Pound or in Euro or in US $ or in Sterling pound as you prefer . I am flying from Saudi Arabia on the 15th of April and I am a South African citizen (will get a visa at Egyptian Embassy) and wanted to find out would I need another visa from Sharm EL Sheikh to Cairo, if I want to book a day trip? because you will get the visa from the Egyptian Embassy , this visa will allow for you to visit Cairo , so you can book Cairo by plane one day trip . For sure you can make your on-line booking and pay your deposit on-line by your credit card . I am traveling with my finance on the 28 December till 1 January for the NYE there. We searched for excursions their and saw your website with great reviews about it, and friends of us told us about you too. We are interesting in doing the Cairo trip (private or by group), quad camel star gazing , mount sinai and colored canyon dahab. Please we need your help to propose us how can we manage to organize our trip with your excursion. we arrive the 28 Decembre at 8h45 at the airport but we have a driver waiting for us to pick us up to the hotel. and we are leaving on the 1 January at 21:00. So let me us know how we can manage this with your help. I thank you for your help and assistance. You will have my email so that we can talk there. Dear Roy , For sure this will be okay to book all your tours with us . All your trips are available during your holiday in Egypt . please contact us by email to be able to Send you all the details of these trips and also how to book on-line and save your time and money . please contact us to info@sharmexcursions.com or sales@sharmexcursions.com or contact@sharmexcursions.com . also our contact number 002-0106-132-9990 . Me and my wife will be coming to Sharm in December. I have read it is safe to travel to some areas in Egypt. Is it safe to travel in Egypt. Can we do all this in one go? What is the best order to do this in? and do we have to go back to Sharm in order to go to the next tour. Many thanks and I hope to hear from you soon. All the trips from Sharm to all cities in Egypt are running normally and very safe . 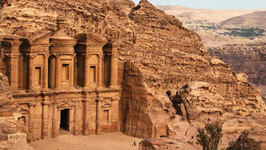 Also the trips to Petra are running twice weekly . You can go on all tours during your holiday this year . please send us to sales@sharmexcursions.com and let us know your email to be able to send you all our deals . Luxor trip by air from Sharm is stopped at the moment but Cairo by plane trip from Sharm are running normally every day ! How do I obtain visa to go to Cairo? Im in Sharm now and only got a visa for here. You need to go to Sharm airport as soon as you can and you will get the Egyptian visa there only in few minutes then get a new stamp of the passport control . Hello , Mount Sinai Private trip will be available in January 2017 on 11th , 13th , 15th , 18th , and 20th January 2017 so you can book it at any day of these days as you prefer . 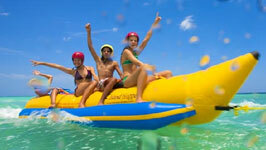 if you will be 6 persons the total cost for all of you for this private trip only 186 GBP. All the local trips and tours in Sharm are very safe and running normally , also the flight trip to Cairo is running normally ! I will be travelling from Sharm El Sheik to Cairo can I get a visa from UK before I travel. You can get the Egyptian visa from UK before you travel or upon your arrival at Sharm airport . on the page it says: Single Guest Supplement: +£8. does this mean that I can pay the full price of the trip for one person and add my husband as an additional guest for the suppment of £8? That means this extra charge in case only one person will book the trip not 2 persons ! you do not need for the driving license to go on this trip . I have booked excursions with you for w/c 8th Feb, at present my holiday is still going ahead but if the travel agent cancels the holiday will I be able to get a refund on the excursions deposit? Every thing will be fine again soon and all holidays in Egypt will be as arranged ! This is the cost for one way transfer ! The Buggy or Rhino will be only for maximum 2 persons ! Regarding booking excursions with our company and payment kindly you will book online and pay only 10% as deposit , once you pay the deposit we will send you the confirmation letter by the internet and we will arrange the time to meet you in your hotel to give you the vouchers and collect the rest amount of money in cash . Can I ask does the Luxor 1 day tour include breakfast / lunch etc? Or do we need to bring food / water with us for the whole day? Is there a detailed itinerary on the website? Lunch is included in Luxor trip and also soft drinks in the van during the tour but not in the restaurant ! Hello, if I was to book the Cairo trip by plane, and the Luxor trip by plane, for myself and my two teenage children, would you offer a discount for this? Thank you for your help and I look forward to hearing from you soon! All our prices into our website are discounted already but because you are a family we will offer you plus the online discount 20 GBP. more discount from the total amount . the cost per person for the trip to Cairo by air from Sharm only 137.75 GBP. per person . I want to visit specific areas in Cairo eg the Al Azhar Park. There are 4 of us and we wanted to book the private tour. I wanted to confirm that the driver and minibus will take us where we want to go in Cairo and not follow the set itenary. for sure this will be ok when you book a private trip ! hello I am thinking of taking a 2 week holiday to sharm el sheikh in the first 2 weeks of December and doing some of your excursions; cairo and alexandris, mt Sinai, Jerusalem and 5 in1 desert experience. FOC is currently advising against travel in Egypt and Israel and I was wondering how safe these trips are at the moment as FOC have warned against terrorism against UK nationals in tourist areas, Mt Sinai, Cairo and Alexandria specifically. Also kidnapping in desert areas. Could you advise us please. Thank you for all your help. All the trips in and from Sharm are running normally and very safe ! Hi, if i pay the deposit today, when do i have to pay the remainder of thr price? you will pay only 10% deposit online to confirm your booking and you will pay the balance in Sharm before your trip ! Is your Jerusalem tour going to be running in December with an English speaking guide? All our excursions with English speaking guide except Jerusalem trip with Russian speaking Guide . Is the Jerusalem tour running? Our Jerusalem trip is currently running at the moment, but I'm afraid only with Russian speaking guide. Hello I was just wondering what would you recommend a woman wearing in Cairo? Hi Emmma, just wear your normal clothes! - Walking round Cairo in a bikini might raise a few eyebrows but other than that clothing isn't an issue. Lunch will be in a lovely restaurant in Cairo overlooking the Nile, but not moving on the Nile. You spend approximately 2 hours at the pyramids, which we feel splits your day up between all the fantastic sights we visit on the tour best. We only use reputable, airlines with great safety records for all domestic flights within Egypt. Was thinking of booking the dune buggy tour but was wondering how to get to the location? It says on the site that you can collect from the hotel and bring back after. What hotels do you collect from? we will be staying the Coral Sea Aqua Club in July. can you confirm if you can collect from this hotel? as i might book some other tours while we are out there. We arrange all our trips from all hotels in Sharm El Sheikh ! Hi. 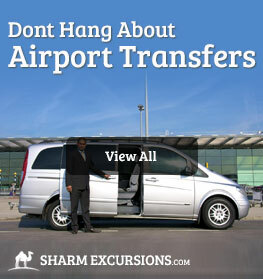 I would like to know that do you pick up and drop off to any hotel in sharm el sheikh? We are thinking of staying in Amar Sina Hotel in Hadaba sharm el sheikh?? I am not keen in shopping, can my group of 3 opt out shopping and stay at pyramid longer? If yes, do u ve 3 places for 14.4.15 day trip to Cairo, pls? for sure this will be okay but you need to book a private trip to arrange it as you want exactly ! Are the trips to Cairo and the Sharm desert adventure 6 in 1 still running? Is there an age limit to the quad biking? It is allowed for the children older than 12 years old to drive their own but if they younger than 12 years old they must be on quad with an adult and in this case the child will be for free in this trip. Hi. I am looking to go on holiday to Sharm for 10nights from 28th September. Just checking are the excursions still on at that time of the year? I will be in Sharm from the 4th of november to the 12th. 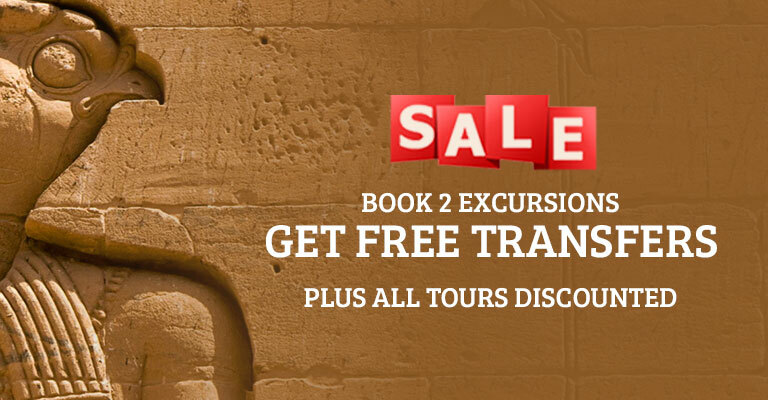 Will all the excursions to Luxor, Cairo and Jerusalem be running? We recommend to book your trips online to have more availability to chose the day which you prefer to go and to save your time and money! Our best deals are always online and we cannot guarantee space otherwise. Is the Jerusalem tour still running?? I'm afraid the Jerusalem trip from Sharm is suspended at the moment. Can you book more than one excursion per day for example Ras mohammed by bus snorkelling trip 0800am-1400pm and then sharm dessert adventure 1430pm-2100pm will the bus definable get you back to your hotel by the times specified. For sure this is okay because you will be back to your hotel about 3 hours before the second trip on the same day ! Was this price per person or per car as my girlfriend would like to spectate but not drive? The cost for this trip only 37 GBP. Per Rhino not per person ! What is the minimum age a child can go on the quad bike with an adult, my son will be almost 5 and im wondering how safe it will be for him? do many children of this age go on with their parents? It is allowed for the children older than 12 years old to drive their own but if they younger than 12 years old they must be on quad with an adult and in this case the child will be for free in this trip . Can we still go inside the pyramids or are they now closed? for sure you can go inside the pyramid itself ! Hi We are traveling in 3 wks to sharm, We are a family of 5, 3 kids 10yrs 7 yrs and 1yr. 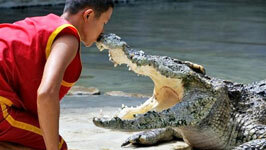 We want to do this excursion, Can the 2 oldest kids go on with there dad? or do all 3 kids need a adult on there bike?? only 1 child can go on the quad with 1 adult ! Please can you tell me what is included in this package, i.e... meals, drinks, you have in the itinerary the flight from Sharm to Luxor but do we need to book our own flight from UK to Sharm? 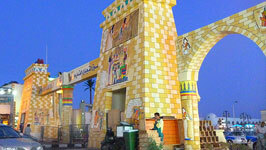 This trip includes also the flights from Sharm to Luxor and also from Luxor to Sharm. How old do you need to be to drive a Quad bike? we recommend to book online to save your time and money because of 5% discount for online booking and also to have more availability for your trip , you need to pay only 10% deposit to confirm your online booking and the balance in Sharm before your trip . hello i see it is safe via plane to visit cairo but is this the same for the tour by bus to cairo, is it still safe and running normally? All the trips to Cairo by plane are running normally at the moment and very safe . To be sure Cairo by plane trip is very safe just follow this link : https://www.youtube.com/watch?v=Jq7TFxZE-uc just to watch some people they were on this trip few days ago with our company . We are in Sharm for only one week, mostly diving. 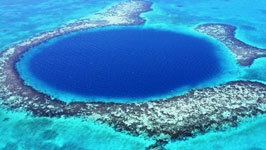 Due to leaving a proper gap between flying and diving, we can only go to Cairo on one day (Wednesday 25 June). However it seems that you only run tours on Mon/Tues/Thurs. Is there anyway to travel to Cairo on a Weds? 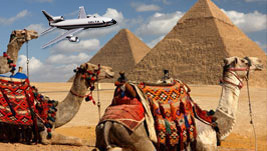 Cairo by plane private trip is available every day except Fridays weekly . Apart from the Egypt visa you purchase at the airport do you require another visa for the Jerusalem trip? How safe is the crossing into Israel now following a coach bomb recently? Is it open as normal? 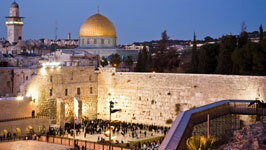 all the trips are running normally , you do not need any other visa to go on Jerusalem trip . Trip to Petra by boat from Sharm is running normally at the moment twice weekly on Friday and Tuesday weekly ! Kindly we would like to inform you that : All the trips to Cairo by plane are running normally at the moment and very safe . To be sure Cairo by plane trip is very safe just follow this link : https://www.youtube.com/watch?v=enjzkzoJwXQ&list=UULuWPHxVYVESbPKaj0wkrxg&feature=c4-overview just to watch some people they were on this trip few weeks ago with our company . Is this trip still running at the moment? People on tripadvisor keep writing me that these are cancelled by most organisations. All the trips to Cairo by plane are running normally at the moment and very safe . To be sure Cairo by plane trip is very safe just follow this link : https://www.youtube.com/watch?v=enjzkzoJwXQ&list=UULuWPHxVYVESbPKaj0wkrxg&feature=c4-overview just to watch some people they were on this trip on Monday 10th February 2014 with our company . 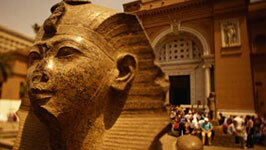 Can you give us please the price of Cairo by plane 1 Day excursion in EUROs? the cost of Cairo by plane from Sharm one day trip will be about 155 Euro per person . Do you have Russian speaking guide for excursion to Cairo? We can offer a Russian Speaking Guide and seperate tour for Russian guests for the same cost as the Cairo by plane trip from Sharm! 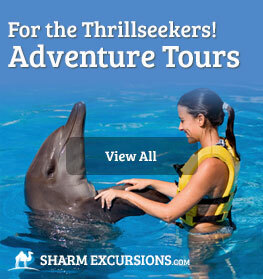 Hi, we are coming to sharm 27th October, and would like to do this trip on the Tuesday 29th October. Two adults and one child 5 years. Please can you confirm if there is availability. Also, we are interested in doing the rhino safari trip on 2nd November for my sons 5th birthday. Will this be suitable. Looking at your site it says child �0, is this because they are a passenger? We would like to book cairo now, and the other trips when we get there, would this be ok? All the trips to Cairo by flight from Sharm are running normally now and very safe ! Yes but is this excursion by plane to cairo for pyramids still running on 22 August with this problems in cairo ?? In August all our tours will be running normally so you can book your trip next week ! Only few trips are stopped now , these trips are Jerusalem , Petra trip , Cairo by Bus , Luxor by plane , Mount Sinai trip but the other trips are running Normally ! Hi, we are due to arrive in sharm for a 2 week holiday. We wanted to do a 1 day tour to see the pyramids, have lunch on Nile etc. Is this trip still going on with the current problems in Cairo? Also wanted to do some other excursions too. Cairo by Plane trip is running normally and also all the local tours in Sharm are running normally ! We are 2 adults and 1 child currently staying at the Royal Holiday Resort. We would like to go on the Camel Ride, Bedouin Dinner and Star Gazing trip next week - are we able to pay for this trip in full by cash as we have no way of paying by credit card? We can pay a deposit if you have a rep coming to the hotel or any pick up / drop offs at our hotel. We are "Sinai Only" on our passports - is this a problem? Do we need a visa for this trip? 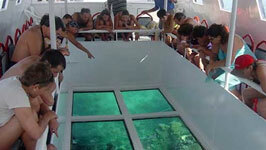 Also, do you do any glass bottom boat trips? 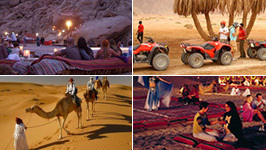 To go on this Camel Ride, Bedouin Dinner and Star Gazing trip you do not need to get the Egyptian visa . you can go online and book all your trips and pay only 10% deposit , once you make your booking and pay the deposit we send you confirmation letter includes all details of your booking ! Kindly we would like to inform you that all our excursions are running all the year ! 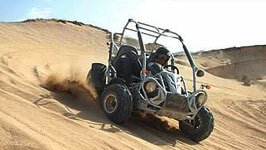 this Sharm Desert Adventure includes about 2 hours Quad Runner driving and being short wont be a problem. Me and my girlfriend are staying at the sonesta beach resort for 2 weeks in June, we are looking to book the trip by plane to Cairo. 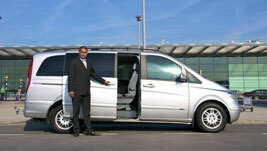 How does it work are we picked up from the hotel or do we arrange our own transport to the airport? for all our trips we will pick you up from your hotel and drop you off at your hotel after the trip just have a look into our website www.sharmexcursions.com to get all other details and to see how to make your booking in easy 3 steps. hi, me and my boyfriend are coming to sharm in April, can we just book excursions on arrival? will they be the same price and would discounts still apply if we chose relevant trips? we fancy mt Sinai, 4 in 1 special and coach trip to the pyramids. will we qualify for a free excursion with them? you can book also your trips while you are in Sharm but you will not get the discount because this discount only for online booking so we recommend to book online to save your time and money. Do you have to have a drivers licence to drive the quad bikes ? No you do not need to have the driving licence to go on Quad Runner trip . we recommend to book your trip to Cairo by air from Sharm online now to save your time and money also to have more availabilty to go on your trip on your preferable date ! 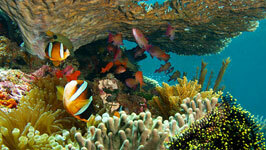 We are visiting Sharm in March and are interested in the private visit by plane for 2 adults and 2 children. What would be the cost of this trip and do we need to visit the perfume factory and papyrus factory or is the itinerary flexible? A Private trip to Cairo by plane is flexible so you can remove the perfume and papyrus factory, also you can stay more or less time at each place . First time in sharm and i just want to check before booking that all trips are adequatley insured this is our honeymoon and want everything to go well. All our tours are fully insured. Happy Honeymoon ! 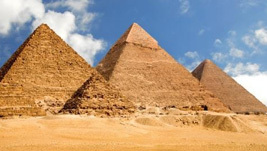 The cost of the bus trip to Cairo to see the pyramids and Egyptian museum only 40 GBP. per person . In Mega Safari trip you can rent the snorkelling equipments for one day use during this tour, the cost to rent will be about 5 GBP per person. Cairo by plane trip from Sharm will be available on 05th , 06th and 08th November 2012 so you can chose the date which you prefer to go on your trip . 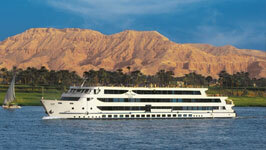 Hi, With the plane trip to Cairo is it possible to include a boat trip on the Nile? If so do we book this before hand and how much is it? Would it be guaranteed? In the trip to Cairo by plane from Sharm you will arrange or book the boat trip on the Nile with your guide in Cairo during the tour itself . We are travelling to Sharm very soon and were wondering if we can book the excursions when we get there or do we have to do it before we leave. We are interested in the Cairo by bus. 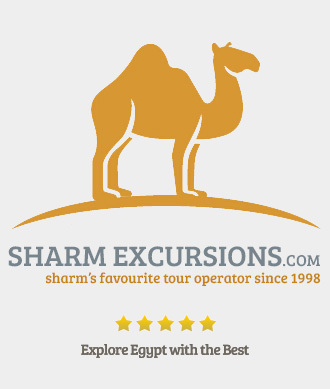 You can book your Excursions while you are in Sharm online because you can make your booking, pay the deposit and get your confirmation letter in few hours. what age group do your children fall into? the child age till 12 years old . I am thinking of booking the quad biking and want to know if my daughter who is 8 can ride on one with myself? Regarding Quad Runner trip it is allowed for the children older than 12 years old to drive their own but if they younger than 12 years old they must be on quad with an adult and in this case the child will be for free in this trip . Hi i will be in Sharm from 15th May and would like to book a day trip to Cairo by Plane, but just have a few questions..
Is it possible to pay the advertised rate in Egyptian pounds once we are in Sharm and how can we get in contact with you to do so? Also do we need any additional documents other than our passports for the excursions and if so how do we obtain these? Are there any other associated costs for the excursion such as entry to the museums or are they all covered by the price. to go on Cairo trip by plane from Sharm we prefer to book on line to have more to go on Cairo trip by plane from Sharm we prefer to book on line to have more availabilty . you must get the Egyptian visa into your passport upon your arrival at sharm airport. on the trip you must take your passports with you . I am very interested in going inside the Great Pyramid- will this be possible on the Cairo 1 Day Excursion from Sharm? Yes this is possible to go inside the great pyramid but there will be extra ticket you will buy it in Cairo, this ticket only 11 GBP. per person . We would like to book bus ride trip to Cairo can you please let me know if the journey is smooth and what type of bus it is as I have a bad back? 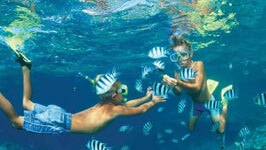 We are flying to Sharm on 21st April 2012, which days do you arrange the tour on? Also which day is the least busiest to travel? Because you have bad back the trip to Cairo by bus from Sharm will be very hard for you because long way driving , we recommend to go by air . Cairo trips from Sharm by bus and by plane are running on Monday and Thursday weekly . hello, can you tell me which days the Luxor by plane operates? 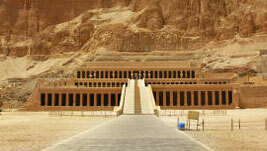 We arrange Trip to Luxor by air from Sharm el Sheikh twice weekly every Wednesday and Saturday. I am not good on flights...can you please tell me - How big and how many seats is the plane from Sharm El Shiekh to Cairo? We arrange Cairo by plane with AMV Charter flight and with Egyptair airline, the planes have 160 and 180 seats for only big planes. 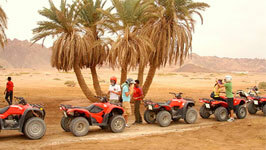 Are children, aged 10 to 15 allowed to participate in quad biking? Regarding Quad Runner trip : it is allowed for the children older than 12 years old to drive their own but if they younger than 12 years old they must be on quad with an adult and in this case the child will be for free in this trip . 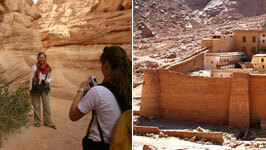 Do you have availability for the day trip from Sharm to Petra on Friday 24th Feb 2012? I would like to book 2 places if so. is it just on Fridays that this trip runs. the trip to Petra by boat from Sharm one day trip is available on Friday and Tuesday weekly so you can book to go on this trip on Friday 24th Feb. 2012. What age can a child ride a quad alone? My son is 14 and rides hisself is that ok? Also we like the sound of the horse riding but none of us have rode a horse before, would this be a problem? Regarding the Quad Runner trip in Sharm Desert : This is allowed for the children older than 12 years old to drive their own but if they younger than 12years old they must be on quad with an adult and in this case the child will be for free in this trip . 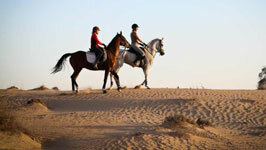 Regarding the Horse ride trip : There is no problems at all if this is the first time in your life to ride horses . Which days do you do the trips to Luxor by air? We arrange Luxor trip by plane from Sharm twice weekly on Wednesday and Saturday . I was wondering whether the sea trip ras mohammed / tiran islands could be combined with the camel ride? 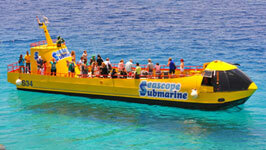 The sea trip to Ras Mohamed or Tiran Island is a full day trip so this is could not combined with Camel Ride trip . I am planning to visit Egypt in September and want to do some excursions but on a budget. Please can you advise which you would recommend, a day trip to Cairo or Luxor? we recommend to go on one day trip to Cairo by plane because no one come to Egypt then leave Egypt without see the Pyramids and Sphinx . The pick up time from hotel in Sharm to go on the trip to Jerusalem by bus will be between 08:00 and 08:30 pm. I am coming to Egypt for a week holiday and would like to do the day trip to Cairo. Do you run this trip every day or are they only on specific days during the week? And do we get a choice of what day we would like to go? 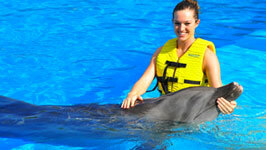 Hi Hayley , we arrange Cairo by plane from Sharm on 3 days weekly on Monday , Tuesday and Thursday . we arrange Cairo by bus from Sharm one day trip twice weekly on Monday and Thursday . for sure you will chose the date which you prefer to do your trip . We are coming to Sharm in November and looking at doing several excursions but before we book I just wanted to see if there was a weight limit on the camel rides ?? In the Camel Ride trip it is ok for the person on the Camel to be till 120 or 130 Kilo gram . How many hours is the plane trip to Cairo? what time do you leave in the morning and arrive back to the resort in Sharm el Sheikh? The plane to Cairo from Sharm takes only 50 minutes, the flight leaves at 06:00 am from Sharm and back at Sharm airport at 08:30 pm. to go on Mount Sinai and St. Catherine trip you do not need to get the Egyptian visa . Is it possible to pay for the excusrions in full at the time of booking rather than when we arrive in Egypt? you can pay the full amount before you leave your country ! we are travellin to sharm in November. We are british citizens. 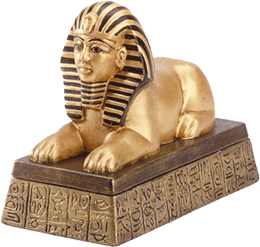 We are going to book Luxor by plane to see the valley of the kings etc. Do we need a visa and if so where do we get this from and how much does it cost ? in all our trips we will pick you up from your hotel Sonesta Beach to go on the trip and after the trip will transfer you back to your hotel . all transfers is included ! In Cairo by plane from sharm one day trip you will take about one hour to go to the pyramids from Cairo airport, boat on the Nile will be for about 30 minutes. For sure we provide Helmets in the Quad Biking trip, all safety equipment is included. hi just wanting an update on trips booked to cairo in view of recent events. Hi Jackie, For the safety of our guests we are currently not running trips and excursions outside of Sharm el Sheikh until atleast Feb 4th. If you are not arriving in Sharm for a while then we are taking bookings under the promise of a full refund if everything is not back to normal when you go. When are you arriving in Sharm? 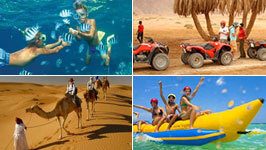 I am looking to book the "Cairo by plane from Sharm 1 Day excursion" for two adults + one 8yr old child. The problem I have though is that my wife hates going on boats! Is there any way going on the Nile boat trip can be avoided? for sure because boat trip on the Nile is optional so if you do not want to do it , there is no problems at all ! Do you do boat trips? we arrange boat trips to Tiran Island only ! We are thinking of booking your Caito by Plane 1 Day from Sharm for July. Is it possible to see the Sound and Light Show at the Sphinx? 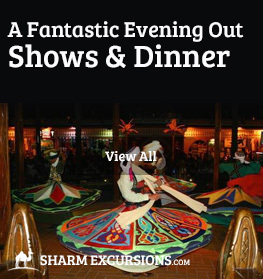 you can book trip to Cairo by plane from Sharm includes the Sound and Light Show at the Sphinx when you book a private trip . 2 persons can share only one quad and the cost will be only 20 GBP. For both of them . Hi, could you tell me how long each person gets in the dome of the seascope? Seascope trip as submarine trip for about 90 minutes. I am interested in the Cairo by bus from Sharm 1 day trip. I am also interested in the Felucca sail boat trip that is an option with this. Could you please advise me if there is a charge for this and if so, how much it is likely to cost. the cost for the Flukka Trip only 5 GBP. per person and you can arrange it with our rep. when you meet him in Sharm before your trip ! 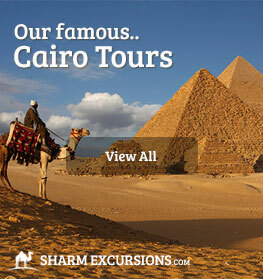 I am thinking of booking the 1 day excursion to Cairo from Sharm by air. I just wanted to check if the price includes the boat trip on the Nile? Boat trip is not included in this price , the cost of this boat trip on the Nile only 5 GBP. I only have time/enough money to do either the Cairo trip or the Valley of the Kings trip in Luxor. Although we would love you to see both, you just can't come to Egypt without seeing the Pyramids in person! We will be coming to sharm this month for my dads birthday he wants to see Cairo by bus we have 4 adults and an infant she's not quiet 2 yet will she be able to come along. yes this trip will be okay also for the infant less than 2 years because she will sleep in the bus! Assalamu Aleikom, I am coming to Sharm on the 2nd December and wondered what time your quad bike trips run from. Big planes flown by Egypt's biggest airlines, 164 seats and 180 seats . On the private tour to Cairo by plane, do you have a minimum number of people that need to book? I am travelling for part of my holiday alone and wondered if you had a single supplement or not? Hi, my girlfriend and I want to book the Cairo by coach 2 day excursion - end of Jan or beginning of Feb. What standard of hotel would we be staying in? Or can you confirm the name of it? If you will book 3 stars hotel it will be Tiba Pyramids Hotel and if you book 4 stars hotel it will be Delta Pyramids hotel. How cold is it at the top of mount Sinai & what clothes should I wear. Currently at the top of mount Sinai about 10 degrees so is not too cold. 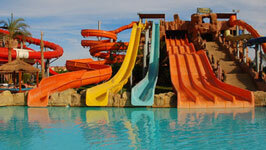 I am coming on holiday to Sharm on the 4th October and would like to book the Aqua park trip as well as others. I wanted to make sure it is the newer aqua park located on the hill rather than the older cleopark? If you could let me know that will be great. Hi, yes we can confirm its the newer, bigger aqua park. Is the lunch that is included in the one day Cairo by plane from Sharm tour in the Hard Rock Cafe? In one day trip to Cairo from Sharm by bus or by plane, Lunch is included in a fantastic riverside restaurant alongside the Nile. 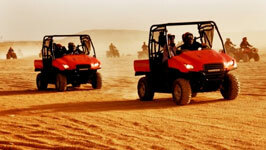 Are children aged 11 allowed on your quad bike excursions in Sharm accompanied by parents? It is allowed for the children older than 12 years old to drive their own but they younger the must be on quad with an adult and in this case the child will be for free in this trip. I was just wondering if the horse riding trip would be suitable for someone who has never rode a horse before? Yes the horses are very well trained and friendly, perfect for novices and younger riders. Husband and I are planning to come and stay in Sharm el sheikh over Christmas time. I got a 4 and a half year daughter and would like to go and visit Cairo for the day. What is the best way to travel?? Is it safe to travel to Cairo? With a young daughter I would recommend flying to Cairo as the journey to Cairo by bus is quite long. I am going to Sharm next week with my wife and three children (9, 6 and 2 years old). 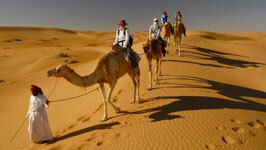 Can you please let me know if I can go to Ras Mohamed and Camel Ride excursions with the two children aged 9 and 6? Can I take the 2 years old child to the glassboat excursion? Thanks in advance for your answer. Hi Paolo , Your older children will be fine but I don't think the snorkelling trip will be very suitable for your 2 year old daughter, for her I would only recommend the Dolphin Show and Glass Boat. 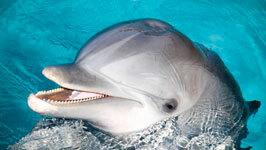 Hello I am coming to sharm on the 04/08/10 could you tell me what you think is the best tour Cairo or Luxor. 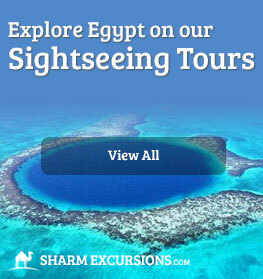 We are thinking of booking the day excursion to Cairo by plane from Sharm. Is there a better day of the week to make this trip or does it not really make any difference? 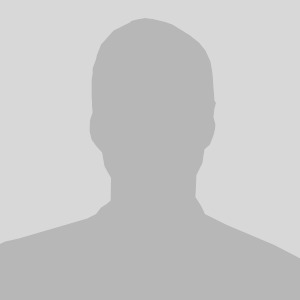 You quote a price of �6.00. Is that per adult one way? Or is that per car/van one way? Hi my son is 11yrs old & rides a motorbike off road in England. He is very sensible & looking forward to driving the Quad bike. Can you tell me if this would be possible. I would like to know the flight times for eg once picked up from hotel to arrival at Cairo. Hi Mohamed. Can you tell me how long the bus excursion from Sharm to Cairo takes and can you guarantee an AC bus. Hi Keith , Kindly we would like to inform you that : this trip takes from Sharm to Cairo less than 8 hours because you leave from your hotel at 01:30 am and arrive to the Egyptian museum at 09:00 am. We confirm that the bus is A/C Bus and with toilet. My boyfriend and I will be in egypt from the 7th of June 2010 until the 17th of June 2010. We were wondering, we have seen a number of excursions we wish to book and are a little sceptical about booking online and wondered if it would be possible to arrange a meeting with yourself or one of your colleages when we arrive at the hotel and we can book them there and then? We are staying at the Hauza Beach Resort in Sharm. 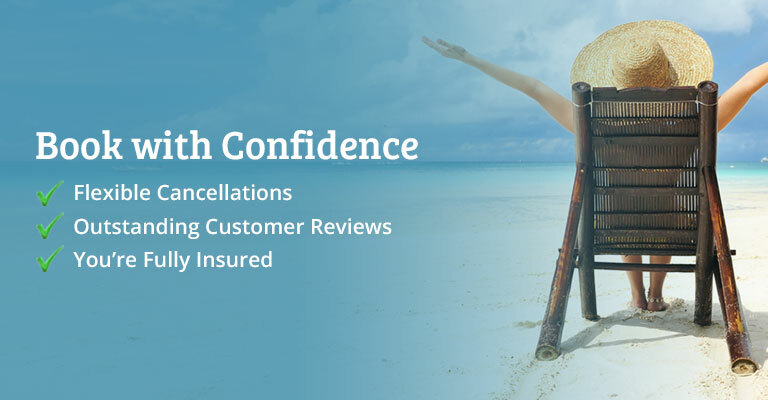 Hi April, we do require you to book online so that we can reserve your place and take a 10% deposit, this small amount is enough insurance for us that you will turn on the day, as there is a large cost for us in running your trip. 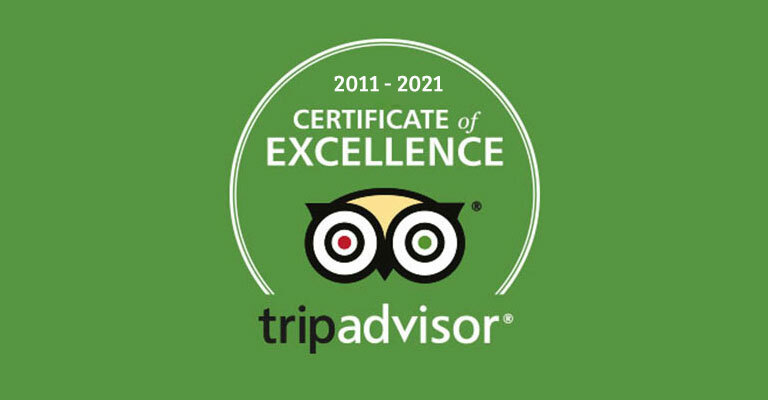 If you're sceptical about booking online then please read our reviews both on our website and on TripAdvisor and I'm sure this will put your mind at rest. We are travelling to Sharm for the first week of June and wanted to book a family trip to Cairo to see the Pyramids etc (by plane). We will be 4 adults and 2 children. Can you advise on whether we should have a private tour or join a group and what your best price is. Can you also advise what options are also available on the day e.g boat trips etc..
Are you provided with a helmet for the quad biking excursion? Yes all safety equipment is provided. 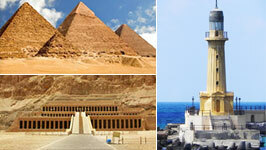 I am interested in the 1 day Cairo excursion by plane from Sharm. What airline do you fly and what kind of plane is it? Is it small propeller operated plane? Hi Kiara, Regarding Cairo or Luxor trip by plane from Sharm will be by charter flight A M C or by Egypt Air and both of them are big planes for 160 seats. Mohamed . We were planning a trip to sharm el sheikh in June. 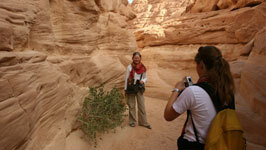 We've used Sharm excursions before and very happy with the service we received. My partner is interested in doing the horse riding excursion. Can you tell me what time of day this is run and will she be okay to do it on her own? We are interested in doing the Mt Sinai trip next week Would we be required to bring warm clothing with us for this time of year? Do you have availability for a private tour to Cairo by plane on Saturday 4th June, for 4 people - 2 of them children. 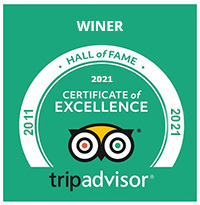 Yes our Private Cairo tours runs daily, please add it in the booking system and select whichever date is best for you. in all our excursions the infant less than 2 years will be for free ! Hi - my daughter visited Sharm last year and went on an excursion into the desert to look at the stars and have a BBQ under the stars - but she cannot remember the name of the Company. Having read your testimonials I do hope this is a trip you can help with. I will be arriving on Sat 20 and staying for one week. This is the details of this trip ! You will ride camels for 40 minutes the desert to watch sunset and practice the real Bedouin life. 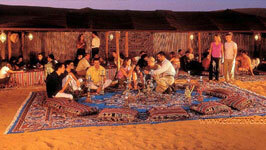 After reaching the Bedouin tent you will have some rest, drink real Bedouin tea with herbs, smoke water pipe ( Shisha ). 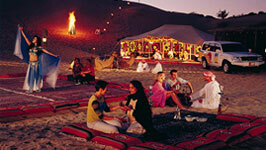 Then you will have a real Bedouin dinner under the candles light in the middle of the desert . And then enjoy with the Bedouin show Bedouin dancing, Belly dancing, Tannura show and at the end listen to the silence of the desert . After this nice show you will enjoy with star gazing and Milky Way through the telescopes placed in the desert and . At the end of the tour we will drive you back to your hotel.